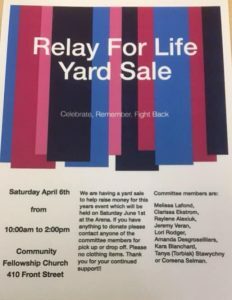 The Relay for Life committee is putting together a yard sale on Saturday, April 6, from 10-2 at the Community Fellowship Church. If you have any items (please no clothes) that you wish to donate, please contact on of the committee members. Thank you for your continued support.